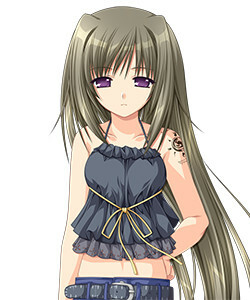 <hidden by spoiler settings>Ririko is Kenichi's elder sister, though not by blood. After their father's failed rebellion, she was captured and, due to the Involvement Clause (which visits the sins of the parent upon the child), given the "Maximum Penalty", the obligation to 'go unrecognized by the world'. Any contact with her is prohibited, be it verbal or physical, and violators will be sent to a concentration camp. The only individual permitted to interact with her in any way is her supervising Special High Class Individual, Houzuki Masaomi. Kenichi's ultimate goal in passing his Exam is to become the new Special High Class Individual to be placed in charge of her, allowing him to interact with her and giving her a kind of reprieve from her 'obligation'. She was Touka's neighbour for a short time, and is largely responsible for molding her current tsundere personality.